Abstract. The X-12-ARIMA software of the U.S. Census Bureau is one of the most popular methods for seasonal adjustment; the program x12a.exe is widely used around the world. Some software also provides X-12-ARIMA seasonal adjustments by using x12a.exe as a plug-in or externally. 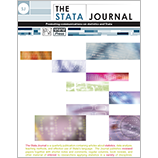 In this article, we illustrate a menu-driven X-12-ARIMA seasonal-adjustment method in Stata. Specifically, the main utilities include how to specify the input file and run the program, how to make a diagnostics table, how to import data, and how to make graphs.